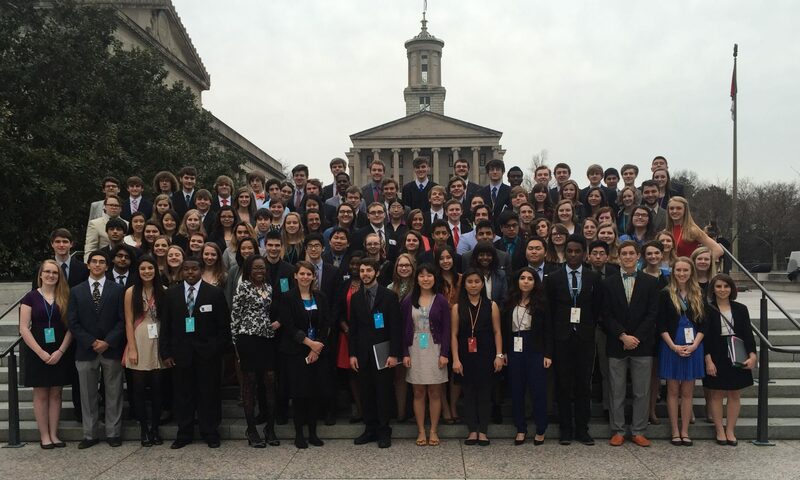 For questions about conference components, debate, bill writing, or research, please check out our YIG Resources page! 1. Contact the advisor at your school to make sure you are able to attend. If your school doesn’t have an advisor, or you don’t know who your advisor is, you can contact Elise Dugger (edugger@tennesseecce.org). 2. Register for the conference your school attends during the registration window. If you visit our middle or high school Youth in Government pages and click on your conference, you will find registration links. What are the conference fees and is financial aid available? Cost per delegate differs by school. However, each delegate will pay a $175 delegate fee and a portion of the hotel fee, which normally totals to around $350. Delegates who drop after the final deadline are still responsible for their delegate fee and any hotel costs the school incurs. Financial Aid is available! Every year, the CCE gives out more than $100,000 in financial aid to students who would not otherwise be able to afford the conference fees. You can apply for financial aid online here. There will also be two nights at the conference where more casual, Y-appropriate clothes are allowed. What is the theme for the dance? This year, the theme for the dance is Space Jam! While the conference is planned by YMCA CCE Staff members, the conferences are run by a team of student-elected high school officers. They will preside over chambers, serve on the Supreme Court, and lead components like the Governor’s Cabinet, Lobbyists, or Press. How can I get involved in conference leadership? There are many opportunities for students to run for office. Consult the Conference Manual for a list of these opportunities and eligibility requirements, and the Election Guidelines for further regulations. Some offices do not require previous conference experience before running. The only thing you need money for will be your meals. You will need to purchase 8 meals in downtown Nashville, though we encourage delegates to bring granola bars, cereal, etc. to offset breakfast costs. Merch will be for sale throughout the conference: T-Shirts for $10, Sweatshirts for $20, and stickers for $1. Pizza can also be ordered through the CCE for delivery at curfew for $10 each. If you wish to purchase any of these optional items, you may want to bring extra money. Delegates who violate conference parliamentary procedure or the code of conduct may also be asked to contribute a small fine, normally a dollar. All of the proceeds raised via donations and fines contribute to the CCE Scholarship fund, which allows more than 750 students to attend the conference who would not otherwise be able to afford the conference. Can family or friends watch? Yes! We encourage family members or friends to cheer their student on during debate. Visitors are only allowed to attend daytime conference sessions and must check in to receive a visitor’s pass at the YMCA Info Desk upon arrival. No student is allowed to ride in any vehicle during the conference. Our full visitor policy can be found here.